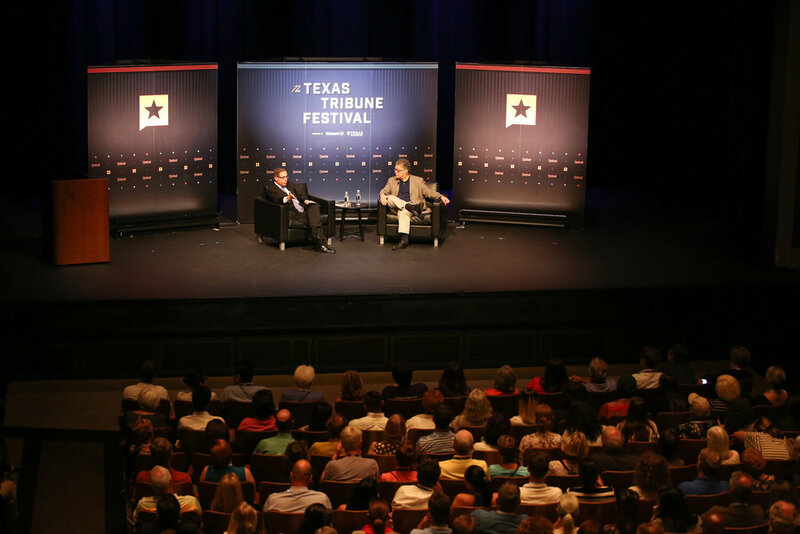 Now in it’s seventh year, the Texas Tribune Festival has brought together 250 legislators and thought leaders at the University of Texas at Austin. The event, held from September 22nd to the 24th, aims to incite discussions “tackling the state’s and the nation’s most pressing political issues”. However, there is no denying that this year’s event is markedly different from years past. Donald Trump’s administration looms large as one looks over festival programming. A wide array of issues are being engaged but the common thread throughout is the Trump administration and its effects on local, state, national, and international politics. Among others, there are tracks on the upcoming 2018 elections, diversity and the law, politics and the media as well as an entire track dedicated to his first year in office. That Trump’s presidency figures so prominently seems only natural when one considers the influence the Office of the President of the United holds. Nevertheless, this influence is amplified when one considers the volatile, petty, and white nationalistic qualities the man holds. His election has taken the country from a divided political climate—one where influence oscillates between two dominant political parties—to one that is completely fractured. There is little hope for reconciliation when white nationalism is advanced at the cost of black and brown bodies; when the earth is dying; when truth is taken as falsity and lies are taken as “alternative facts”. The Texas Tribune has brought together speakers from both sides of the aisle in an attempt to create nonpartisan discussions—hoping to bridge the gaps between those that seem to stand so far apart. While this may seem like a worthwhile cause, festival programming reveals what we contend is a more pressing issue: the myth of the objective US political system is crumbling. While we may like to think that our democratic systems, ideas, and institutions are best (whatever that may be)—and only require negotiation between conflicting parties—it is becoming evident that this is not the case. We are on the precipice of change as we struggle to redefine what US political systems and ideas of democracy will be. Politics is not static and in the discussions engaged over the weekend, we anticipate it will become evident. Stay tuned for upcoming thoughts from this weekend’s panels and events. From the get go the title of this panel was deemed insufficient or inaccurate. How can we talk about things like “local control” and “liberty” in a context like Texas where these things clearly do not exist? Clay Jenkins, a judge from Dallas, highlighted the recent overturning of Denton’s democratically enacted fracking ban by the Texas state government. Gina Hinojosa, a State representative for the Austin area, brought up the recent Uber “Prop 1” initiative which democratically banned the company from Austin, which was then also overruled at the state level. Clearly neither “Local control” nor “Local liberty” mean a whole lot in these cases. However, these stark examples of what Jenkins comedically dubbed “The Big GOP Nanny State” did not stop the avowed Libertarian Senator Don Huffines (son or grandson of wealthy car dealership owner and now real estate mogul or something) from decrying the imposition of local regulations—like tree preservation—from impinging on “our God given rights.” Much back and forth then ensued over the contradiction between abstraction of “Freedom from Big Government” and the reality of dictatorial Big Government imposition of the “free market” on rebellious cities. As the panel wound along it became clear that a more accurate title might have been, “Perspectives on How to Govern Cities: Civil Rights first or Property Rights First?” The Democratic representative and judges rallied around defended the rights of the constituency against the tyranny of the free market (though they would never put it in such terms! ), while the Libertarian and rightward drifting rural representative stood up for the pragmatism of granting developers and corporations absolute power over the city spaces they purchase, as this creates jobs and the economy is all that matters, and so on. Tragically, the limits of the by now standard Democratic “resistance” to the powerful march of the outright business-first party were displayed, brave rhetoric notwithstanding, when the subject of a new Amazon plant came up. “Denton is the perfect place for a new Amazon plant!” exclaimed Clay Jenkins, who moments ago gave a moving defense of the struggle for ordinary Dentonites to take control of their city from corporations that would pollute and abuse it. “No, no, no, I think Austin would be a better fit!” Gina Hinojosa broke in energetically. The room was filled with subdued but jovial laughter. It is impossible to survey the current political climate and not take into account the manner media shapes our thinking. Whether it is fake news, the undermining of traditional journalism, or the development of new platforms, media informs our political day-to-day. Furthermore, this media landscape is changing both due to technological advancements and shifting audience demands. This panel brought together leaders from different organizations attempting to adjust to the changing media landscape. There was Melissa Bell, publisher of Vox Media and co-founder of Vox.com, the news website embracing changing technologies to “explain the news”. There was Peter Hamby, head of news at Snapchat, one of the fastest growing social networks. And there was Sudeep Reddy, Managing Editor at POLITICO, the American political journalism company. Although, the three panelists represented qualitatively different media entities, there were several concerns that spoke to their individual organizations and the media landscape as a whole. When asked to speak to the biggest issue affecting media, Melissa Bell had three words, “Roger Ailes legacy”. There has been a vast polarization of audiences and it has become increasingly difficult for media entities to break through. This consequently, has set the stage for “fake news” and allowed right-winged media organizations to hone in and galvanize particular audiences. Hamby and Reddy, while acknowledging this fact, seemed to lament shortening attention spans. The implication of this being that the onus falls on media organizations to create content that is quick and easily digestible. It is this kind of content that lacks substance and makes journalism vulnerable to the “fake news” phenomenon. They both recognized the need to create content with substance while catering to the needs of the new kind of media consumers. While, Hamby and Reddy both had a valid argument, Bell raised an interesting point: when does the onus fall on content creators? Media organizations continue to build platforms that employ game theory that rewards short attention spans. Long form content is falling by the wayside not only because of consumer characteristics, but producer tendencies. This was an issue the whole group could agree on with the caveat being that they have higher-ups to answer to. If they are going to have the flexibility to create long form content that is more substantive, then it is up to audiences to demand it. In the meantime, they will strive to find that middle ground between digestible and good. The panel closed with a hopeful moment: finding answers to some of the issues raised in this panel has the capacity to circumvent political polarization and ultimately affect positive change. For some benign reason the author thought this panel might feature a discussion of the southern border and the various stupidities that now pass for serious conversation on the subject. It turns out this was a mistaken assumption. Discussion on “National Security” centered exclusively on what one might today comically dub “The Axis of Eastern Evil.” North Korea, China, and Russia. High profile power brokers like Malcolm Nance, Joaquin Castro, and Will Hurd, joined by two international studies professors, weighed in on the Eastern Evils with varying degrees of militarism. The consensus on North Korea is that Seoul, and the millions of people that live there, are too close to North Korean artillery to make physical military conflict a realistic option and any bluffs to the contrary by Trump are bringing the world closer to World War levels of slaughter. “The generals should take Trump’s phone away from him” brought enthusiastic head nods from the panel. As far as China goes, interestingly, the tone came to take on one of, “China is basically going to be the new global hegemon,” in the past tense. The only differentiation came in discussing damage control. ‘Can Trump negotiate trade deals that prevent China’s Amazon alternative Alibaba from continuing to erode Amazon’s market share? Will China swoop in to take away our Latin American allies if the “America First” agenda continues to alienate them?’, etc. The mostly center left leaning panel all tended to agree that, ironically, Trump’s America First agenda has not only not brought America “back” to being number one, but it has actually accelerated our longer term hegemonic decline on the international arena. Whereas now the US looks like a deranged aging monarch, a rising power like China can look like the reasonable one whom the lesser nations should follow, the argument seemed to go. And then there’s Russia—our age-old lifelong nemesis. Whereas military options were deemed impossible for North Korea and China, Russia, on the other hand, brought heated agreement on the necessity of military conflict. ‘They invaded the Ukraine, they hacked our elections, they are the complete antithesis of American values, Putin is a KGB trained power hungry bloodhound who will not rest until American power is completely neutralized,’ etc. Congressman Hurd was especially emphatic. His contention was that we would be within our rights to lead the community of nations in arming the Ukrainians to do battle with Russia in the Crimea. Of course, our history of arming rebels has had such a stellar and successful track record in the Middle East. One can hardly wonder why average Americans have not been more energetic about pursuing this option. Which leads to an underlying central fear of the panel: the manipulable American masses. Everyone seemed to agree with Executive Director of the Terror Asymmetric Project, Malcolm Nance, when he made overtures to the helplessly impressionable American voters whom Russia so easily tricked into believing “alternative facts,” “fake news,” and all that. Due to the fragility of our democratic institutions in a world increasingly led by authoritarian parties and autocratic leader, the thinking went, we are uniquely ill-equipped to retain our position as global leader. Again there seemed to be little hope, besides a call to educate our students in the computer sciences at a national level, with hopes that the US could catch up with the informational apparatuses of Russia and China. The unspoken logic of this line of reasoning is of course that, if Clinton had won (or rather, if Trump had lost), the US would be making much smarter choices, would be retaining our hegemony much better, would be keeping China, North Korea, and Russia at bay with Obama era shadow-theatre policies and so on. A more nuanced version of intelligence experts and political power-brokers saying “I told you so,” not so much to Trump as to American masses that elected him, betraying these elites. A sublime moment interrupted this mundane, nut and bolts imperialism, panel when Malcolm Nance unexpectedly responded to the discussion of military options for North Korea by declaring that ‘we shouldn’t be having this conversation. We should be discussing six months paid sick leave!’ To which he was greeted with thunderous applause from the packed auditorium. Yet, like summer rain in San Antonio, the moment was gone as soon as it came. This panel brought together major Democratic players in Texas and national politics. Among the panelists there was former State Senator Wendy Davis, Chairman of the Texas Democratic Party Gilbert Hinojosa, CEO of the Democratic National Committee Jess O’Connell, and State Representative Chris Turner. The goal of the panel was to discuss what the Democratic Party plan is for the upcoming 2018 elections and more precisely, the possibility of turning Texas blue. While the name of the panel was meant to connote strategy, the discussion mostly dwelled on some of the challenges facing the Democratic Party. Rightfully so—after all, how do you fix something without unpacking what’s wrong with it? It is in these moments of reflection—moments where Democratic leaders surveyed the wreckage of the last few years—that some critical issues came to the fore. In one of the afternoon’s more poignant moments, Wendy Davis lamented the lack of Democratic voter participation noting that Texas is already blue and it is only a matter of getting people out to the polls. Thus, raising the issue: why are people not voting? How is the Democratic Party failing to connect with people in Texas? Gilbert Hinojosa carried this point further stressing the need to mobilize Latinx voters. The implication of course being that Latinx voters are the key to unseating Republicans in Texas. Although Democrats recognize the importance of a rapidly expanding Latinx population, there is little consensus on how to mobilize the Latinx vote—not only in Texas but nationally. The disparity appears to be consistent with what we saw play out in last year’s Democratic primaries: mainly identity vs. class politics. Panelists were quick to point out that identity and class concerns are not mutually exclusive in politics and that the Democratic Party must be able to bridge the gap. Whether Democrats are willing to adapt remains to be seen, and given the party’s track record, people could not be faulted for remaining skeptical. Regardless, what was clear from the afternoon’s discussion was the party is struggling to redefine itself. The status quo will not work and it remains to be seen if the Democratic Party is willing to make the shift. Back on the cities track this panel brought in a powerhouse lineup including the Mayors of Austin, San Antonio, former Mayor of Houston, and the mayor of Indiana Bend, Indiana. The air nearly crackled with power—nearly. That is, it might have in a different decade, but on the 24th of September of 2017, the air barely hummed with anything higher that the drone of a struggling air conditioner. This is because in the fallout of Trump’s election the legislative power of Democratic Party, which houses nearly all of the big city mayors in Texas, has been all but completely decimated above the local level. The federal government is GOP red, most governors are now GOP red, gerrymandered districts are now red, and so on. This somber fact, acknowledged by the moderator, set the stage for a panel that might have more aptly been titled, “The Limited Science of Urban Climate Damage Control.” None save the mayor from Indiana seemed particularly enthused to be on the panel, and without powerful allies in the state and federal government it’s hardly surprising why. As the moderator put it, city mayors and councils are now more or less the last line of defense against the world’s most pressing and complicated global threat to date. More dire, however, than the annihilation of Democratic power in the places that matter, is that lack of a vision for cities by the party itself. The most passionate moment of the whole panel—besides Annise Parker’s defense against the accusation that Houston is a concrete island built on top of a swamp—came when the Indiana Bend mayor discussed a specific development project. The project consisted of the re-purposing of an old automotive factory into a mixed digital storage/chic urban housing facility, and he really got going when discussing the way in which the heat exhaust from the servers (which are very costly to cool) was funneled into the housing portion of the facility for heating which kept costs low and made a tidy deal of the whole thing. In itself this is a cool innovation, there’s no denying that, but in the broader context it helps partially explain why the Democratic party is where it is today. That is, for the politician and the developer, such a project means either a fat paycheck or a great campaign talking point. For the ninety nine percent of everyone else who aren’t these things, however, it amounts to little more than gentrification, the erosion of city culture, and displacement—and if you look at Democratic urban policy over the past forty years, this policy line is not an exception, it is a rule. Adler, Parker, and the new Niremberg, all must compete against one another to attract (with tax-generated incentives) hyper rich developers to gentrify their city and bring in metropolitan yuppies with expendable cash so as to provide a solid tax base with which to fund their own municipal social programs—in order to generate more gravity for potential developers, who will snag more professional transplants, who will spend more money, and so on to infinity. Hardly any surprise then why everyone at the panel seemed so bored. Municipal governance of this variety is not even politics to begin with, it is business management. And, if the business demands infinite growth but climate change mitigation requires regulation of finite resources and expendables, then it is no wonder why a look of resignation settles on the Democratic mayor discussing climate change. They know that so long as they must compete with each other and promote infinite growth a true climate change solution remains impossible.